I stepped onto a plane in Dallas as Rickie Fowler stepped to the tee on the 11th hole at the Waste Management Oklahoma State Phoenix Open with a five-stroke lead. By the time we took off, Fowler’s lead was down to one. He had only played one hole. Fowler played the 11th at TPC Scottsdale in seven strokes after his third shot went over the green and into the water. He placed his next shot on a bank beyond the green, and while he was checking out where to chip it, it too rolled into the water. Another stroke. Another stroke of bad luck. So he dropped another ball — which this time stayed on the ground — and got up and down from there for what he said later was a “really good triple.” Ahead of him Branden Grace birdied the 12th hole, and Fowler’s lead, which was seven over Grace to start the day, was now one. Fowler went on to bogey the 12th, too, and it looked like another blown lead on another Sunday for somebody who has had some trouble closing out events. This was the 7th 54-hole lead/co-lead of Rickie's PGA Tour career. He shot over par on Sunday each of the previous 6 times. He's +4 today. But Fowler bounced back with a filthy shot into the par-5 15th from 254 yards, which led to birdie. He parred the famous 16th as Grace bogeyed ahead of him. Then he pummeled a driver onto the green at the par-4 17th. Another two-putt birdie, and his lead once again swelled to two. But it still wasn’t over. Fowler hit his drive on the 72nd hole into some thick brush in a bunker but was able to get out up near the green and notch another up and down for par and the fifth PGA Tour win of his career. It wasn’t pretty — or anything resembling pretty — but a 64-65-64 to start the event plus a bounce back at the very end resulted in another trophy for Fowler at an event he’d flirted with several times. Rickie Fowler: -5.74 strokes gained tee to green in final round, worst final round by a @PGATOUR winner in ShotLink era (since 2004). “I hope I never have to go through that again,” said Fowler of the bumpy 3-over 74. “The way I was playing this week, I mean, I knew it wasn’t going to be easy, but I thought it was going to be a lot easier than that out there today. It didn’t engender a ton of confidence in somebody who was building a reputation for fading late in events, but the story with Fowler is also a little more nuanced than it first appears. He is somehow both overrated by the general public and underrated by people within golf. I think he’s like Kyrie Irving in that way. His Q-rating doesn’t match his production, but his production is also a little misunderstood. Nobody would say those guys are overrated, but we do with Fowler. This is all we seemingly talk about when we talk about Fowler. Why? Because he doesn’t win as much as he probably should. In a sport as singular as golf, winning matters. And when your statistical profile is such that it shows you should be winning twice a year but you only win once every two years, it (fairly) spawns questions. So who knows where we go from here. I think there exists a scenario in which the lion’s share of Fowler’s career wins come at the end of his PGA Tour run instead of the beginning (for example: Fowler’s stats are much better than somebody like Brooks Koepka, who has won three majors in his career). But maybe not. We love to make broad, sweeping conclusions after single events, but as always it takes time to formulate legacies. Regardless, I was reminded of something on Sunday evening as I watched Fowler’s post-Phoenix presser. He has one valuable thing which most people at this level don’t have: Perspective. 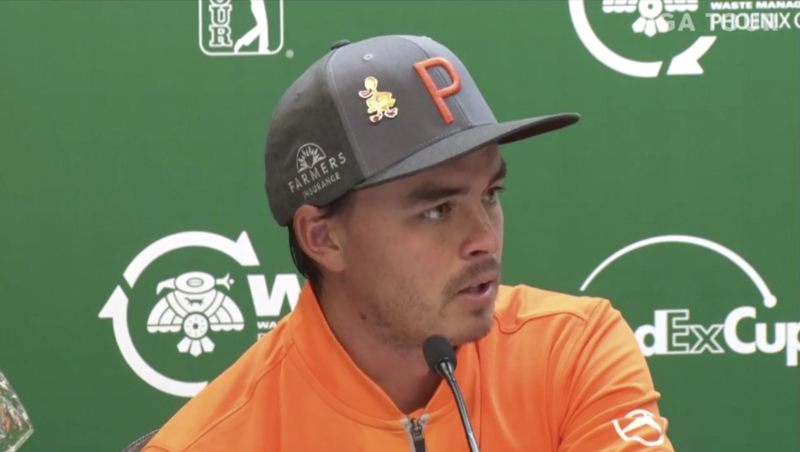 “Whether people say I’m not someone that gets mad enough or I guess whatever it may be, that they think golfers should be or people that win should be,” said Fowler. “But at the end of the day out there for me the way I was brought up by my parents, my grandparents and the people I surround myself with is life’s a lot bigger than just the day-to-day stuff.